Venture Philanthropy Club members visit Cleveland Social Ventures Partners a philanthropic venture fund that utilizes the venture capital approach, “investing” pooled funds in selected nonprofits and at the same time offering their time and professional expertise. Entrepreneurship is practiced by students across the Denison campus through classroom projects, the pursuit of personal ideas, and collaborations with faculty, staff, and alumni who are experts in their fields. The Red Frame Lab is home for students who are interested in design-thinking, innovation, and entrepreneurship. 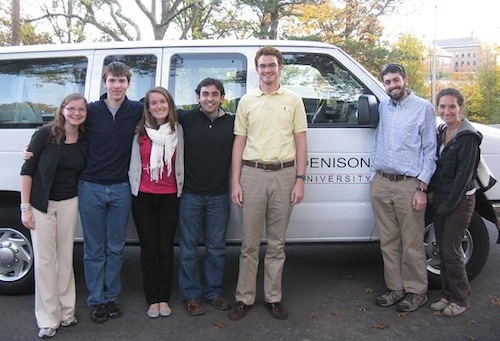 Two student organizations are especially focused on these themes: Denison Enterprises and Denison Venture Philanthropy. Grants for the Denison Venture Philanthropy program are mostly funded through the generosity of David Kuhns, a member of the Denison class of 1968. In 2008 Kuhns challenged Denison students to organize an effort based on philanthropy – but one that also required an investment of student time as well as dollars. The DVP creates strong ties between the college and the community and offers students experience with real-world issues. Denison Enterprises offers student-led business programs, all of which enhance the value of students' education on campus. Denison Enterprises seeks to bring self-sustaining student-run business ventures to campus that provide experimental business learning opportunities to undergraduates. To learn more about student organizations or how to start your own, please visit Start a New Club or Organization.